The Toiletlift provides a constant up and down motion at the pressing of a button. 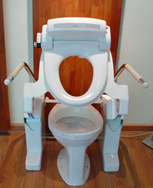 Driven by actuators on the left and right sides connected with a synchronic control mechanism the Toiletlift maintains a steady lowering and raising motion. Length Power Cable 275 cm.